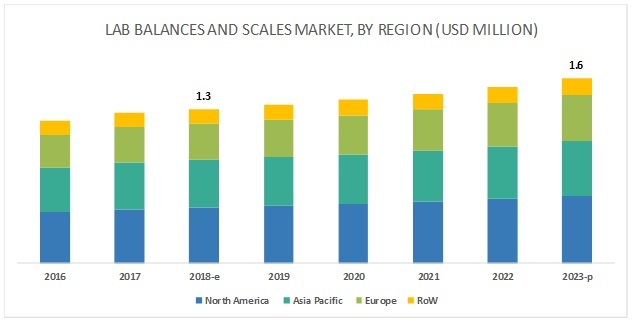 [219 Pages Report] The laboratory balances and scales market is projected to grow from an estimated USD 1.3 billion in 2018 to USD 1.6 billion by 2023, at a CAGR of 3.7% during the forecast period. The study involved four major activities to estimate the current market size for lab balances and scales. Exhaustive secondary research was done to collect information on the market and its different sub-segments. The next step was to validate these findings, assumptions, and sizing with industry experts across the value chain through primary research. Top-down and bottom-up approaches were employed to estimate the complete market size. Thereafter market breakdown and data triangulation was used to estimate the market size of segments and sub-segments. In the secondary research process, various secondary sources such as annual reports, SEC filings, press releases & investor presentations of companies, white papers, certified publications, articles by recognized authors, gold standard & silver standard websites, regulatory bodies, and databases (such as D&B Hoovers, Bloomberg Business, and Factiva) were referred to identify and collect information for this study. The lab balances and scales market comprises several stakeholders such as laboratory balances and scales platform manufacturing companies, product sales and distribution companies, pharmaceutical, cosmeceutical, and biotechnology products testing laboratories, chemical and material testing laboratories, food and beverages testing laboratories, and clinical research organizations (CROs). The demand side of this market is characterized by the expansion of research pipeline among Pharma-Biotech & CROs and regulatory framework for product safety in bio-pharma technology industry. The supply side is characterized by advancements in technology. Various primary sources from both the supply and demand sides of the market were interviewed to obtain qualitative and quantitative information. After arriving at the overall market size using the market size estimation processes as explained above the market was split into several segments and sub-segments. In order to complete the overall market engineering process and arrive at the exact statistics of each market segment and sub-segment, the data triangulation and market breakdown procedures were employed, wherever applicable. The data was triangulated by studying various factors and trends from both the demand and supply sides in the lab balances and scales industry. Major 10 players covered, including A&D Company, Ltd (Japan), Metler Toledo international, Inc. (US), Sartorius AG (Germany), Shimadzu Corporation (Japan), and PCE Instruments (UK). This research report categorizes the lab balances and scales market based on product, end user, and region. 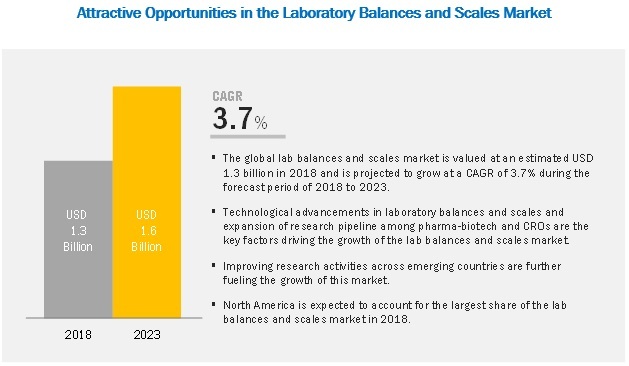 The lab balances and scales market is projected to grow from an estimated USD 1.3 billion in 2018 to USD 1.6 billion by 2023, at a CAGR of 3.7% during the forecast period. Growth in the lab balances and scales market is primarily driven by factors such as technological advancements in laboratory balances and scales; expansion of research pipeline among pharma-biotech and CROs; increasingly stringent regulatory framework for product safety in biotechnology and pharmaceutical industries; and growing public emphasis on Implementation of stringent food safety guidelines. Laboratory balances are used to compare the mass of two different objects (such as solids, liquids, and tissues) those are used in laboratories. The growth of the lab balances segment is attributed to factors such as the greater regulatory compliance for product quality and increased research pipeline that replicate into higher lab balances usage. Pharmaceutical, cosmeceutical, and biotechnology products testing laboratories utilize lab balances and scales to determine the weight of biopharmaceutical substances for research & development activities and quality assurance. Factors driving the growth of the pharmaceutical, cosmeceutical, and biotechnology products testing laboratories segment include growing developmental pipeline of key manufacturers and expansion of research facilities by the product manufacturers & private organizations in the industry. The North America is one of the major revenue generating regions in the lab balances and scales market. North America and Canada are the major countries responsible for the dominant position of this regional market owing to factors such as presence of stringent regulatory guidelines and extensive regulatory compliance for product quality among target end user industries and the strong presence of major market players in the region. Furthermore, growing research pipeline among the biopharmaceutical companies and ongoing technological advancements in the field of lab balances and scales are also driving the growth of this regional market. A&D Company, Ltd (Japan), Metler Toledo international, Inc. (US), Sartorius AG (Germany), and Shimadzu Corporation (Japan) were the top players in the global laboratory balances and scales market. Other prominent players present in this market include PCE Instruments (UK), Kern & Sohn GmbH (Germany), RADWAG Balances and Scales (Poland), Adam Equipment Co. (UK), Avery Weigh-Tronix, LLC (UK), Bonso Electronics International, Inc. (China), Essae Group (India), Gram Precision S.L (Spain), Humboldt Scientific, Inc. (US), Scientech, Inc. (US), and Danaher Corporation (US), among others. Mettler-Toledo International, Inc. (US) is one of the leading players operating in the lab balances and scales market. The company has manufacturing facilities across the US, Germany, the UK, Switzerland, and China and has a strong distribution network across more than 100 countries includes Canada, France, Switzerland, India, Japan, Malaysia, Australia, New Zealand, Vietnam, Singapore, Brazil, Mexico, Denmark, and Poland, among others. The company offers a wide range of laboratory balances; those are used across various testing laboratories such as drug testing labs, food testing labs, beverages testing labs, and biotechnology labs, and petrochemical testing labs. The company mainly focuses on the development of technologically innovative products to further strengthen its position in the market. As a part of this organic growth strategy, the company launched XPR Micro and Ultra-Micro Balances in June 2016. In June 2016, the company launched the XPR Micro and Ultra-Micro balances. This helped Mettler-Toledo to improve its position in the lab balances and scales market. What are the growth opportunities related to the adoption of ultra-micro balances across major regions in the future? Emerging countries have immense opportunities for the growth and adoption of lab balance and scales. Will this scenario continue in the next five years? What are the various laboratories wherein lab balances and scales finds a high adoption rate? What are the new trends and advancements in the lab balances and scales market? 10.5 Bonso Electronics International, Inc.
10.11 Mettler Toledo International, Inc.
*Business Overview, Products Offered, Recent Developments (2014-2018), MnM View Might Not Be Captured in Case of Unlisted Companies.